Richardson the Man of the Match concluded the game with figures of 4/26. Australia were the underdogs going into the first ODI against India in Sydney. 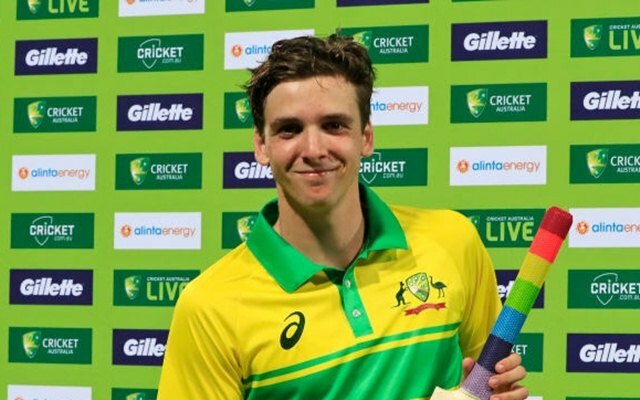 However, after a spirited batting performance which helped them post a competitive 288 batting first, the all-new Australia new-ball attack came out firing on all cylinders and they blew away the Indian top-order. The pair of Jhye Richardson and Jason Behrendorff at one stage reduced India to 4/3. In their opening burst, they gave nothing away as they kept the visitors down to 21/3 in the powerplay. However, after the first three wickets, Rohit Sharma and MS Dhoni weathered the storm and batted cautiously. While Dhoni consumed quite a few dot balls at the start of his innings, he was a lot more fluent as his innings went along. He was 6 off 36 balls at one stage but motored along well after the initial struggle. However, as soon as he got to his half-century, he was adjudged LBW off debutant Jason Behrendorff. Dhoni wasn’t happy with the decision but India had no reviews left. Replays confirmed Dhoni’s disappointment as the ball clearly pitched outside the leg stump and was thus not out. That wicket brought an end to a 137-run partnership and India could never get the same momentum again. Man of the Match Richardson who took 4/26 felt that Australia were lucky to breakthrough at that stage. He feels that it could have taken the game away from the hosts. “There was a period there when they had a partnership through the middle and it almost could have taken the game away from us. But we were lucky to get Dhoni out lbw and we kept getting wickets from there on,” Richardson said in the post-match press conference. The No. 4 position has been an area of concern for the Indian team since the 2015 World Cup. As many as 11 players have been tried at that slot and no one batsman managed to cement their place. India’s middle-order seems to be a touch wobbly and teams have tried to exploit that. India’s limited-overs vice-captain Rohit Sharma feels MS Dhoni is ideal at No. 4. He runs well between the wickets and has the ability to find gaps as well. With his big-hitting skills on the wane, there have been calls for Dhoni to bat higher up the order. Currently, Ambati Rayudu occupies that No. 4 spot and has done well in the limited opportunities.